Ocean City, Maryland is located 20 minutes away from Assateague Island. Take a drive to Assateague and see the wildlife and wild ponies. Make a hotel reservation in Ocean City and enjoy a day at the beach. Travel along the Ocean City boardwalk for entertainment and amusement. Sightseeing, fishing, golf courses, restaurants, and a nearby location to Assateague Island are what make Ocean City a vacation paradise. Ocean City, Maryland is the only beach resort in Maryland that meets the Atlantic Ocean. Ocean City and Assateague Island were previously one and the same island. The Ocean City inlet, formed during the storm in 1933, made the two islands separate. Since the inlet, the two worlds on each side have drifted far apart in terms of natural resources. Ocean City is now located approximately 1/4 mile away from Assateague Island and is separated by the Ocean City Inlet. Ocean City, Maryland has all the hotels, restaurants, vacation rentals and amusements anyone could ask for, while Assateague offers many natural wonders. Ocean City extends 10 miles north from the inlet at Assateague all the way to the Delaware state line. In 1952, the completion of the Chesapeake Bay Bridge meant easy access to Ocean City for people in the Washington-Baltimore area. In 1964, the Chesapeake Bay Bridge Tunnel was completed and visitors from the south near Virginia Beach could visit easier as well. Ocean City has now become a playground of the Mid-Atlantic and is one of the gateways to Assateague Island National Seashore. Ocean City offers miles of beach, great fishing, sightseeing and surf for those traveling from New Jersey, Washington D.C. and other locations along the East Coast. Ocean City, Maryland has many hotels, motels, condominiums, and vacation rentals to choose from. Once visitors leave their hotels, many venture to the boardwalk. The southern end of the boardwalk starts at the Ocean City Inlet. At the inlet, you can watch sport fishing boats as they return or leave to the ocean. The boardwalk is where you will find many amusements and it is just steps away from a day of swimming or a relaxing day at the beach. 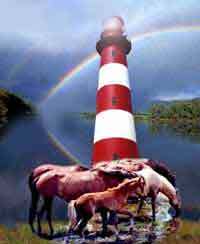 Take a drive down to Chincoteague Island to look for the wild ponies at Assateague, see the Assateague Lighthouse and experience the solitude that miles of pristine beach here can offer you. Drive just an hour south and you will reach Chincoteague Island where you can go on a nature cruise or kayak tour along Assateague Island, shopping, bike riding, play miniature golf and more. Nearby, you can explore the Chincoteague National Wildlife Refuge and Assateague Island National Seashore.